This blog post is going to talk about a simple way to convert normal 2D pictures or photos to high dimensional datasets; and then use MDS tool to analyze those data. At the end, I'll mention some potential uses of this type of analysis for data from practical cases. Assuming that we have a picture that is represented by a MxN matrix of pixels, The pixel matrix can be simply converted to a matrix of real numbers by replacing each pixel with its intensity (or brightness) using the formula: a = 0.114*R + 0.587*G + 0.299*B; where R, G, B are the red, green and blue intensities of the pixel. We consider this MxN matrix as a N-dimensional dataset with M data points, where each data point is just a row vector in the matrix. We notice that MDS maps topologically have simple sequential structure, so no information are embedded into the topological structure. MDS maps rather carry information through geometrical characteristics. For instance, a section of smooth curves; a large arch; a section of points with less density; etc. ; Also, two distant sections winding together in particular way may indicate special feature of the underlying data. Furthermore, when we use 3D MDS maps, those secondary structure over the sequential structure may reveal much more rich complex information about the high dimensional data. Thus, MDS maps may offer new ways to describe and analyse the initial picture. We might ask here: why are the MDS maps of the picture sequential? To answer this question, let's image that we scan the picture from top to bottom, line by line, and store the line in a vector, then this vector will gradually change from one line to the next line. Thus, this line vector manifest a kind random-walk in the high dimensional space mostly with relatively small steps. 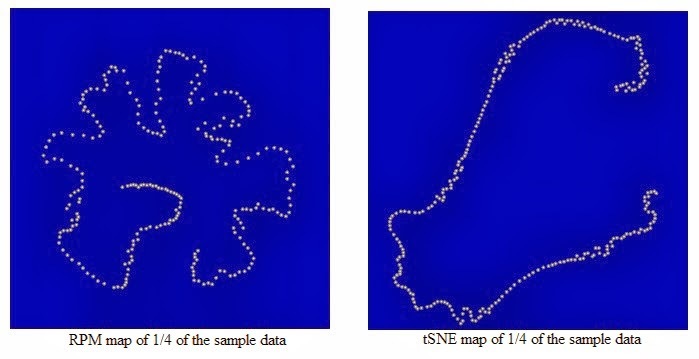 Those random-walk alike datasets exist in many areas of data analysis. For instance, a while ago I have blogged about one such case where the state of the whole stock market has been considered as an random-walk process. 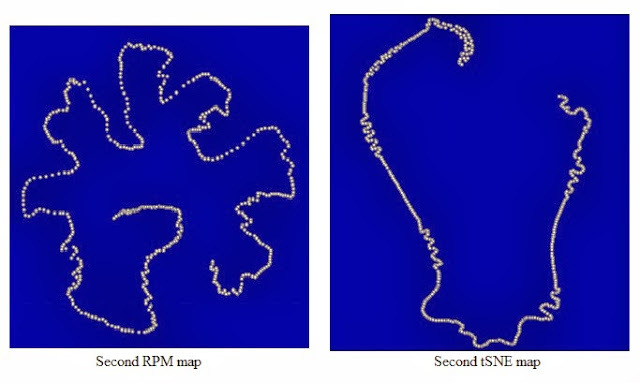 We notice also that the MDS maps shown above resemble, more or less, those map in the blog self-similarity of high dimensional random-walk. We notice the apparent similarity of the above RPM map with that produced for our sample picture previously. Thus, notions and methods developed for analyzing pictures may apply to a broader scope of data. One interesting question arises in view of above picture is: Can we produce 2D picture (maybe not as nice as the photo of Lena but with easier recognizable features) out from a high dimensional dataset like the S&P 500 dataset? The answer is pretty much positive, and I'll blog about this in another post where I will talk about about multidimensional sorting.